In Zagreb, the average since 1973 is 40.8 days, ranging from 26 in 2001 to 53 in 2002. Zagreb's average is also similar to whole Croatia's average. Areas in the mountains and on the remote islands get less than 20 annual days while cities on the northern and southern Adriatic coast get up to 60 days, some even more. 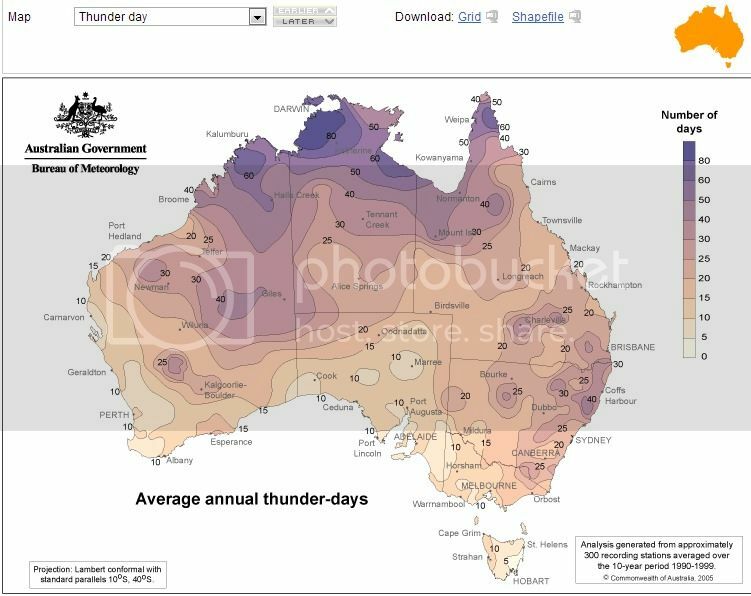 So what is the average for your location, and what are the most and least thunder-prone areas in your country? Last edited by ksolina; 09-09-2013 at 08:19 AM.. I live in about the least thundery part of England with 7.9 days with thunder a year. Most stats from tutiempo.net, Buxton from my own observations. These data are from periods of 20-30 years so very accurate. Average over the UK is about 10-11 per year. The numbers are very variable over short areas, due to topographical reasons mainly. Manchester Airport is only 16 miles away from here but they get double the thunderstorm days per year. Northernmost parts of Lapland have 3 or 4. Cloud to ground flash density, per square km per year. In other words, the number of times there is a cloud-ground strike in a particular square km block per year. Heathrow averages 14.4 thunderstorm days for the 1973-2012 period. The weather centre averaged 15.0 days between 1973-2004. I've heard we get 5-9 per year here but I swear it's less than that. Some years we don't get any thunderstorms here at all. This year we had 2 fairly big ones. I don't know. 10-15 days of thunder audible but I doubt we get anywhere near that many overhead thunderstorms on average. Leeds only had 1 overhead storm last year and has only had 2 this year. There have been other occasions with thunder/lightning nearby, or storms just clipping us but not delivering a direct hit. One day in August had 3-4 storms pass by without hitting us! I don't know. 10-15 days of thunder audible but I doubt we get anywhere near that many overhead thunderstorms on average. Leeds only had 1 overhead storm last year and has only had 2 this year. Do you keep a count of them? Leeds bradford airport averaged about 8 days a year over a 30 years period but due to local topography it could be quite variable over short distances. No, I don't. I know how many storms we had so far this year and 2012 , but I can't remember how many storms we had in the previous years. I remember two good storms in 2011 but I'm sure we had a storm bonanza one week in September when I stopped paying attention and all of a sudden we started getting thundery downpours galore - but they were probably just that, thundery downpours. Average here is 18 days. Hard to believe. I would say 12 (at best). The lowest in entire country. Last edited by Jesien; 09-09-2013 at 09:48 AM..